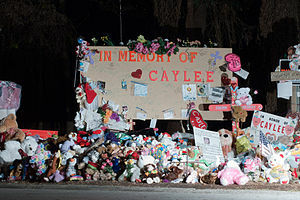 Today is the 2 year mark of the day that Caylee Anthony vanished from the lives of those who knew and loved her. It is also the two year mark of the day that her mother personified the selfish, spoiled brat that we know as her now, Casey Marie Anthony. While it is not the day that we would normally call an anniversary in the normal sense of the term, it is a day that marks two years of lies, deception, unbelievable irreverence to little Caylee’s memory, a day that no one but her own mother knew she was no longer here on this earth. Her grandparents, while I can’t say this for a fact, may have also known to a degree what was going on, and simply realized a month later that they could no longer cover up Casey’s act of greed and selfishness, without the world around them pointing fingers at not only their daughter, but possibly at themselves as well. This is only speculation on my part, mind you, but I feel like there’s enough lies and covering up done by George and Cindy Anthony to speak for itself. Caylee Anthony was a beautiful child. Her precious face captured the hearts of America, but only after she vanished. There is so much more that this beautiful child could have become. Instead, thanks to the inexplainable behavior of her closest family members, she has become another sad statistic, and an example of what thousands of other abused children must go through every day. This is something that only we, the people of America, can change. These are our children, grandchildren, next door neighbor’s children, nieces, nephews, students, and friends. Together, we can stop child abuse, if we just open our mouths and take the right actions.